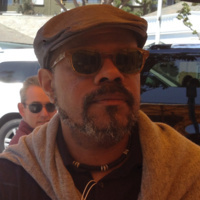 John Keene chairs the Department of African American and African Studies and is Professor of English at Rutgers University-Newark. He also teaches in the Rutgers-Newark MFA in Creative Writing Program. He is the author of the novel Annotations (New Directions, 1995); the poetry collection Seismosis (1913 Press, 2006), a collaboration with artist Christopher Stackhouse; and the short fiction collection Counternarratives (New Directions, 2015), which received the inaugural 2017 Republic of Consciousness Prize for Small Presses, as well as a 2016 American Book Award, and a 2016 Lannan Literary Award for fiction. Counternarratives was one of two finalists for the 2016 William Saroyan International Prize for Fiction Writing. Keene's other published work includes GRIND (ITI Press, 2016), an art-text collaboration with photographer Nicholas Muellner, and the poetry chapbook Playland (Seven Kitchens Press, 2016). He has published his fiction, poetry, essays, and translations in a wide array of journals, and his honors include a 2003 New Jersey State Council on the Arts Fellowship in Poetry, a 2005 Whiting Foundation Award in Fiction and Poetry, and a 2008 Fellowship for Distinguished First Poetry Collection from the inaugural Pan-African Literary Forum. Keene's introduction to the first English translation of Brazilian writer Hilda Hilst's novel The Obscene Madame D appeared in Fall 2012 (Nightboat Books/A Bolha Editora), and his translation from the Portuguese of Hilst's novel Letters from a Seducer (Nightboat Books/A Bolha Editora) was published in February 2014 and was named to the Best Translated Book longlist in 2015.